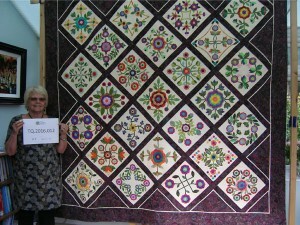 Sue talks about a quilt made by Kingfisher Quilters to celebrate their 30th Anniversary. She explains her involvement in the project, the design and making as well as what will happen to the quilt now. Later she talks about her quilting journey; including how she joined Kingfisher Quilters after a particularly difficult year in her life. Denise’s interview also explores some of the different quilts she’s made, the technology she uses in her quilting and her role as a quilt teacher. Kathy Hunt [KH]: This is an interview with Sue Nickson, TQ 2016.12. We’re talking at Sue’s home in Redditch in Worcestershire, and I’m Kathy Hunt. Sue, thank you for agreeing to take part in Talking Quilts. Can you start by describing the quilt that we have in front of us here? 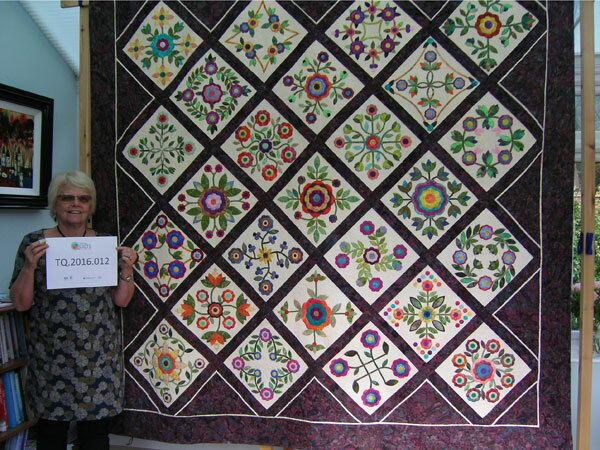 Sue Nickson [SN]: Right, it’s a large Rose of Sharon quilt. It has 25 blocks of Rose of Sharon patterns, and they’ve all been appliquéd in batiks, on a cream batik background to each block, and then the sashing is a batik which is a kind of maroon and teal colour, so it’s a nice dark background so the blocks stand up. It’s got… The blocks are on point, and there are… the inserts are surrounded by a cream fillet to define them, and then it has a nice wide border of the sashing fabric, [interruption] and it is bound in the same fabric as well. [Interruption] And on the back, we have got a multi-coloured back made of lots of pieces of the fabric in the front of the quilt. KH: Right, could you just explain what a fillet is? SN: A fillet is a, a narrow piece of fabric, about an inch wide which is folded in half, and inserted into a seam so that you get a, a loose like a little flap which is a quarter of an inch wide. That’s a fillet, that one there. KH: Thank you. Whe… Who made the quilt? SN: It’s been made by Kingfisher Quilters as a group, and more than 30 people have taken part in making the quilt. It’s been made to commemorate our… the group’s 30th anniversary. It was started by a lady called Jean Campbell in her front room, [laughs] 30 years ago, and has developed now into a thriving group with 75 members and we felt that was worth commemorating, marking. So it’s been… The quilt has been made as a raffle prize for our exhibition in September. KH: Right. Are you… How were you involved in this? 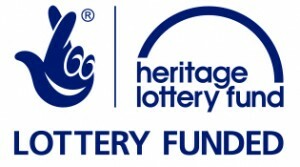 SN: Well I got asked to organise the exhibition and I decided it would be nice to have a quilt to raffle. The last exhibition we had we raffled a quilt and made a lot of money so the plan was to do the same again. I was not gonna make the quilt. I wanted as many people as possible in the group to be involved in it, but I was happy to design it, co-ordinate it, bully and chivvy [laughs] to get it done, and I have to say the group stepped up to the plate, did just that. KH: And where did you get the ideas for the design? SN: [Clears throat] Well I’d seen the quilt, a smaller version of it, made by one of the ladies who comes to my Saturday group. And I decided that if you’re going to make a quilt that you want other quilters to buy raffle tickets for, it needs to be a bit special. It needs to be a bit spectacular. Why otherwise would a quilter [laughs] buy a raffle ticket for an ordinary quilt? So I wanted it to be spectacular, I wanted it to be doable, I wanted it to be inclusive, so I wanted it to be something that people of a huge variety of ability could take part in. I’ve tried making group quilts before and if it’s a block that you have to piece they never end up the same size, so that’s why appliqué was a good idea. And the other inclusive bit was, I bought the backing fabric and the sashing fabric, but the group donated all the rest of the fabric for the appliqué, so it ca… It all came from the group. So I then designed twen… well I didn’t, I, I begged, borrowed, adapted, found 25 blocks, and I then set about devising 25 kits so each person got the backing fabric, the pattern, and sufficient fabric to actually complete the block, with instructions of how it was to be done, with instructions as to what size stitch they were to use and what type of stitch to get some sort of consistency of standard. Nobody was excluded, so some blocks are simpler than others. But I didn’t tell anybody they couldn’t do it. One or two people brought them back and said, ‘I can’t do it.’ But that’s fine. But I did get 25 blocks successfully completed in three weeks. KH: … or could you talk about that, please? SN: Yes. Um what I did, I ended up being given lots of, lots and lots of bits of batik fabric, and my main aim was to make sure that the colours were distributed reasonably evenly across the quilt. I didn’t want one block that had something different to everybody else. So I actually had all the batik fabrics and it was a bit like a paint box where I actually sort of… And I tried to include, and you can see if you look at the quilt, I tried to include in every block some pink, some blue, and some yellow. The idea was to make it multi-coloured, because then you can’t have people saying, ‘Oh I don’t like pink,’ or, ‘I don’t do green.’ The idea was to make it as sort of universal, if you like, as possible. So I actually in… They all had an envelope and in the envelope they either had pieces cut out, ’cause I did have the use of an Accuquilt cutting machine, so some of the pieces were cut out, some they weren’t cut out but they were given the patterns and they were given the pieces big enough, and they were given the Bondaweb or Steam-A-Seam or whatever it was, and they were given the bias; I actually made all the bias pieces for the stems and they were given those. They weren’t told where they went on the pattern. So where they were given like where they were given leaves that were made out of different fabrics they weren’t told which green had to go where. That was their input, they could put it anywhere … they liked so that they had some input into the finished design really, and that seemed to work very well. Some people did things I didn’t expect, but that’s fine [laughs] and I’ve been really pleased at the standard of the work that’s come back. It’s pretty consistent across the quilt. It’s very difficult to say that one block is … really good and one block isn’t. They are all of a very, very similar standard which is great! KH: Well it certainly looks beautiful. Can you tell me a bit more about the actual method of doing the appliqué, please? SN: It’s a Bondaweb method, so each piece has… is, is actually stuck onto the background, and then it’s machine appliquéd using a blanket stitch. 0:08:34 are… they require more skill to do. This one is probably the simplest one for a mixed group of people to do. KH: How do you apply the Bondaweb to the back of the fabric? SN: You just press it on. It’s pressure sens… It’s a pressure sensitive film. You can get them with… Normally they have two sides, so they ha… you have your adhesive film and you have two pieces of paper, one either side. [Clears throat] One comes off quite easily, and that is a pressure sensitive adhesive. So you press it onto the back of your appliqué fabric, don’t have to iron it normally, you just press it on, [Clears throat] you draw your design on it, you dor… draw your design on the, on the, the, the paper side that you’re leaving on, and then you stick it onto the back of the fabric, you use your design line to cut it out, and then when you’re ready to position it you peel the second paper off and place it where you want to place it. It’s normally moveable at that stage, so you can put it down, if it’s not right you can move it. When you’re happy that it’s in exactly the right position, you apply heat and that makes the, the adhesive fast. KH: … and who has done it? SN: I’ve done the quilting. I did all of the quilting. Somebody else had promised to do it for me, and chickened out when she [laughs] saw the quilt; didn’t, didn’t wish to be responsible. There was a lot of discussion in the group, I understand – I wasn’t there that particular night – about having it done commercially, having it done by a long arm quilter. I was against that idea because I felt it sh… It was a group quilt and I wanted it to be a group quilt. Added to which the idea is to raise money and so I didn’t see there was much to be gained by spending money to have it quilted, if that was gonna be money that you weren’t gonna raise if you see what I mean. It would also need to have been… Because the designs are all different it would have had to be custom quilted, which is very expensive to have done, so I bit the bullet and I set it up and I did it. So basically each of the blocks has been outlined, so I’ve, I’ve, I’ve quilted around the… each of the shapes, and then I have vermicellied in-between, and what that does is it flattens the background and allows the design to pop a little bit so it stands a little proud, so it gives it a slight 3D feel. The sashing has just been done in straight lines because I felt they didn’t need to detract from the quilt; they, they, they were just there literally to hold it together. And then I got to the borders and I had to decide what to do on the borders and all I’ve done on the borders is basically a chequerboard… on point, because it’s easier to do it on point because you don’t get so many ends [laughs]. KH: And what sort of stitching have you used for the appliqué? SN: It’s a blanket stitch, and the instruction was it was to be a number two width and a number two length on people’s sewing machines. Not every sewing machine gives you exactly the same stitch, but actually if you look at the quilt they weren’t far off. People were asked to use whatever thread they’d got, but to try and match the thread to the colour of the fabric that they were appliquéing, which most pe…. which people have done, and I did suggest to people that actually, because we’re using batiks, variegated threads work particularly well and, and that’s what a lot of people have used. KH: … how would you describe that? SN: That’s free motion vermicelli, basically. It’s a free motion method of quilting, where you basically draw with a sewing machine, and it’s just a way of filling in largish spaces which are not uniform, so you can’t do a standard design. Added to which, the appliqué is the… important part of each block, the background quilting is really just to draw attention to it. 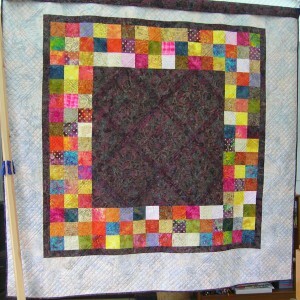 If you don’t heavily quilt the bits in-between, you tend to end up with a baggy look, which I, I personally don’t like. KH: Were the blocks put together before you did the vermicelli? SN: Yes, they were. It, it was put together by one of our group members, who’s actually very good and very accurate at putting it together so yes it was put together as a complete top, [Clears throat] and then we came to the back of… we had to have a backing fabric. We had some of the sashing fabric left, so we used that on the back. But I’d been given all these batiks and I had lots left, and I was in a bit of a quandary as to what to do with it; it wasn’t mine, I couldn’t give it back to people ’cause I didn’t know where it had come from particularly, so what was I going to do with it? So what we did in fact was we cut it into four-inch squares and we joined it together and made, a large part of the back using the squares, and that enabled a… some more people, who hadn’t felt they were competent enough to do the front, to get involved in doing something on the quilt, which was great. KH: And is there a label on it? SN: Not yet. The label is designed, the label is printed, it is now going to be given to the lady who’s going to make the label, and we’re gonna put some of the appliqué from the front on the label, as well, so that’s all ready to do. KH: And would you say this is a double bed sized quilt? KH: It is. Is it meant to be used as a bed quilt? SN: Yes. Yes, it is. SN: It’s meant to be useable. It hangs down quite nicely; a bit more at the sides. It’s always difficult with a square quilt; it never quite works. But actually it’s been resting on my spare bed and it actually looks quite nice. Well it actually looks very nice [laughs]. KH: It does indeed. Right, shall we move on to… Do, do we feel like we’ve um, described the quilt adequately? SN: I think photographs actually will show it off better. KH: Yes, those will show up, indeed. Tell me a bit about yourself and how you got into quilting and what, what happened? SN: Well, I’ve always sewn, ever since I was… about nine I suppose. I taught myself to dress make. My mother couldn’t sew a button on so I got not help there at all. And then I went on to ta… to train as a domestic science teacher, as it was called in those days, and so I ended up teaching cookery and needlework and I did a lot of dressmaking in the early days because in those days it was actually cheaper to dress make which I’m not sure it is anymore but it was certainly in those days. So I used to do a lot of dressmaking for myself and for friends and whatever. And back in the Sixties I was living in Germany, ’cause my husband was in the RAF, and I had masses of scraps of fabric, so I decided I would make a quilt. I knew nothing about patchwork at all, and I was going to make hexagons. So I cut them all out very carefully out of cardboard, which is a mistake I’ve now discovered, and I made lots of hexagons and I sewed them altogether using the fabric that I’d got. KH: Was this by hand? SN: This was all by hand, yes. Nobody told me about crimplene. And, and it looked fine until I actually took the cardboard out, at which point all the crimplene just popped up like little domes because of course you can’t press it flat. I didn’t know about wadding, and I didn’t really… so I did… and I didn’t really know about quilting, so I just put a sheet on the back of it and it was truly hideous. I mean there is no two roads about it, it is… was truly hideous. My mother loved it, and my mother had it on her bed until the day she moved in to a home. And I have to say at that point I did put it in a skip. I rather wish now I hadn’t put it in a skip, [laughs] but that’s history if you like. So, then through the rest of my time teaching I, I was teaching and I was teaching needlework, and actually the last thing I wanted to do realistically in the evenings was sew so I, I, I really didn’t do any… I did bits. If it happened to be something that came up in the syllabus or I could do as part of a class, I might do a bit, but I wasn’t doing any really for myself at all. And then in 19… I left teaching in 1989, and joined my husband in our aerospace business. How different can you get? [Laughs] That was all fine until my husband had a heart attack in 1999. We had a terrible year. My father dropped dead, my un… in the garden; my mother found him dead in the garden. My uncle dropped dead. My brother-in-law was diagnosed with a brain tumour and within six weeks had died. And he died on the Saturday and on the following Monday my husband had a heart attack. And then my mother broke her hip so we were having one of those hideous years that people have. So I was running the business on my own, I’m looking after my husband, I’m trying to look after my mother, I’m trying to… Oh, a nightmare. Anyway, so, anyway it got … we got to about 2000 I think where actually… ’cause my husband had his heart attack in June two thous… 1999, and by the time we got to the s… to the middle of 2000 I was really beginning… He was better, my mother… was managing, things had eased off a little bit, and I felt it was time to do something for me. And I w-walked one Thursday night into Kingfisher Quilters I ha… I didn’t even know they’d existed before then, to be truthful, although I’d lived here for since the Seventies. And I got a tremendous welcome from them, I have to say, and they’d just started making a medallion quilt as a group project. And I’d got a sc… I’d got a block that I’d made at school, for some reason, so I’d got the middle of my medallion quilt, and off we went! And that medallion quilt now sits on my sister-in-law’s spare bed. KH: And what is a medallion quilt? SN: A medallion quilt is a quilt where you have a central panel, which can be a block, it can be appliqué, it can be… anything you like really, and then that is extended by a series of borders; normally each border has a different discipline. So I think on the one we did one was curves, one was triangles, one was appliqué, one was… whatever, so it… you’d just then go on putting borders on until you get it to the size that you want it to be. And that really got me back into… sewing for pleasure really and the rest’s history as they say really. I was… quickly on the committee and chairman qu… fairly quickly [laughs] after that. 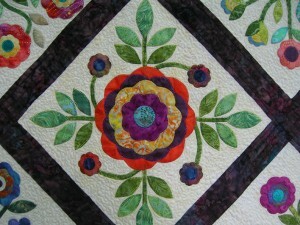 KH: Were there very many members of Kingfisher Quilters who you could say really influenced your quilting? SN: Difficult to say. Influenced me, not style wise I don’t think or design wise, but I was certainly influenced by the sharing and the friendship and the encouragement that I’ve always found you get from a group. 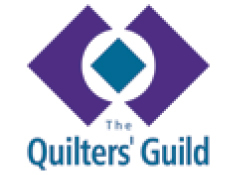 I find quilters to be very sharing people, always willing to help, always willing to give… advice if you’ve got a problem. You do tend to get several types of advice, [laughs] you then have to pick your… pick the bones out of it a bit, but they just encouraged me to get on and they were hugely friendly and hugely encouraging and I’ve been a member ever since! KH: Well that must be one of the things you enjoy about quiltmaking. KH: Is there anything else? SN: What I enjoy about quiltmaking is actually encouraging other people. Rather than quilting for myself, which I do, I actually get the biggest reward from encouraging and teaching and… helping to develop other people’s quilting. I am not short of ideas as a rule and I’m actually technically quite competent, so I’m often able to show people how to do something or how… or they’re struggling with something. I’m also a mathematician, so [laughs] that helps hugely when somebody wants to alter a size of something or, ‘How do I work out how big my borders have to be,’ or whatever, so I can usually help with that sort of thing. But that’s where I get my biggest reward is from helping other people develop and I have seen some of the people in the groups that I, I’m involved with, develop hugely, which is very satisfying. KH: I believe you started a group of people who quilt. KH: Would you like to talk about that? SN: Well there’s two. There’s one, one that happens on a Wednesday. That wasn’t actually started by me. That was started by my friend Alison. Alison and I had an online business together, and we felt that, oh, it became obvious that Kingfisher Quilters was getting too large to enable people to sew at a meeting, ’cause once you’ve got 50 people you can’t do anything practical. And there were people joining who wanted to learn how, how to quilt, or how to do patchwork or improve what they did. So we started a group on a Wednesday, the idea being it was to encourage beginners really, and that has been running ever since and most Wednesdays. Nobody signs up to it, it’s they come along. They have to be on the list. There’s about 35 on the list I suppose in total. But we get about 20 most Wednesdays. Some people just bring what they’re doing, some people come because they’ve got a problem with what they’re doing and they want help with what they’re doing, some people come and say they want to learn how to do something, in which case we’ll teach them how to do whatever they want, and that happens on a Wednesday. And then I got a request, because there were quite a few people who were saying, ‘I actually go to work, I can’t come on a Wednesday,’ and Wednesday’s full anyway, so I do one once a month on a Saturday now as well, so that enables people who are at work. And I’ve got a few new people who’ve joined that recently who are absolute beginners and that’s lovely. KH: And what do you call these groups? SN: Beoley Babes, [laughs] because we meet at Beoley Village Hall [laughs]. KH: You mentioned, when you were describing the quilt about, how you cut out the pieces using a machine. KH: Are there any… Could you describe that machine, please, and is there any other technology you use? SN: Right, the machine I used is called an Accuquilt GO! If anybody does card-making, it’s, it’s a die cutting machine. Very common in card-making for cutting paper. But this one is specifically designed to cut fabric and it will cut up to eight layers of fabric at a time. And so it’s … It ha… It… It’s, it’s one of those things that has its uses in my opinion. Lots of people use it a lot; I don’t. If it’s a case of cutting out squares and things like that I’d just as soon use my ruler and a rotary cutter. But it is quite good for things like the flowers in this quilt where they’re a slightly awkward shape. And it’s… You can actually manipulate the fabric so you, you get quite good use out of the fabric. So it’s very good for shapes where you want them all to be exactly the same because if you’re cutting them out by hand… You can’t cut these shape… These flower shapes, you can’t cut with a rotary cutter and a ruler so you have to cut them with a pair of scissors, and as soon as you do that you start to get them varying in size so a machine that cuts them all out exactly the same size is quite good, especially when you want the same size all the way across a quilt. So I used that for that. Apart from that, the technology that I mostly use is a quilt design program called EQ7. I started with EQ5 I think. And that enables you to, design a quilt. It enables you to design a block, it enables you to put it all together. What’s quite nice about that, especially for some of the people that I teach, is what they can’t do is see what the finished result’s going to look like. And so what I can do is I can actually… They’ve decided they want to make this block and they want to turn it into a quilt. I can actually pull the quilt up on the computer with the block that they’ve chosen to do, and I can actually scan in the fabrics that they’re going to use, so you can actually put the right fabrics in the right place so they get a much better idea what the finished quilt is going to look like. It also enables you to play with things like the width of the sashing or the width of the borders, which means that you can see that, ‘Oh no, that looks too big,’ or, ‘that looks too small.’ So it allows… It, it helps you with a lot of the design process if you’re not using a pattern. And I do try and encourage people not to just slavishly follow somebody else’s patterns, but to actually have a little bit of originality because it’s not hard, [laughs] but so many people are so nervous about the finished result, because it is expensive. You know it’s not a cheap hobby. It’s very expensive these days. If you want to make a decent size quilt you’re gonna spend £100 on fabric easy, and that’s a big investment if you don’t know what it’s gonna look like. So a lot of beginners will buy a kit which includes the fabric, so someone else has made the decisions for them, but there’s a picture, so they can see what it looks like. So if I can give them the picture using their fabrics then they’ve got a much better idea of what it’s gonna look like, and how big it’s gonna be, ’cause that’s the other thing that’s tricky, is working out sometimes ‘if I have a block that size how many do I have to have to make a quilt this big,’ whereas the, the, the program does all that for you. And then the other technology I use is I use just simple Word on the computer to do labels, because you can use, [Clears throat] you can use the alphabets and the big prints and you can size them and you can put in images, and then you can print onto fabric. So that’s what I’ve done for the label for this one. It’s actually got on the back that it’s been made by Kingfisher Quilters and our little kingfisher logo is on the label. And the other thing I always put on the label is washing instructions, because otherwise nobody knows what to do with a quilt, and if you use Word you can actually print it on in relatively small writing, which if you try and do it with embroidery it doesn’t work, so just using Word. But Word’s great for just using things… simple shapes. If you want to do squares, if you wanna do hexagons, if you want to do triangles you can print templates out using a program like Word, it don’t have to have anything complicated. It’s quite… All sorts you can do. KH: When you print this, how do you make sure that it’s colourfast and washable? SN: Well it… The, the ink… You have to have an ink jet printer, and I buy… My, my printer won’t accept lots of things, it just plays up, it won’t perform, but it will accept… You can buy fabric on a backing that’s printable which is d… which is treated so that it will accept the ink, [Clears throat] and my printer likes that. It’s quite expensive this paper, but as long as you sort of don’t make your labels bigger than you need you can, you can get several out of a sheet. But it’s treated so that it accepts the ink. And then all you need to do once it’s printed is you let it dry and then you just rinse it so that it comes clear and then iron it and the heat sets it and it’s fine! KH: And what would be the simplest bit of equipment that you use that you wouldn’t like to be without? SN: A ruler I would think! A ruler and a rotary cutter, is the simplest. It’s what I use all the time. You can buy all kinds of fancy templates and you can buy all kinds of fancy bits of equipment, but most of it you can do with a ruler and a rotary cutter, as long as you learn to use them properly. KH: Yes. Do you quilt at home very much or do you have time to? SN: No, I don’t. Because I’m often teaching and I, I teach workshops and I do talks, a lot of my time at home is actually spent making samples and examples. I mean, for example, I’m doing a talk at our next Kingfisher meeting, and people don’t realise how much preparation it takes to talk to a group for 45 minutes. And if you’re making samples and examples it can take t… ta-take a very long time. And if I’m gonna do something I like to do it properly so I te… I spend a lot of time doing that and if I’m teaching somebody something that I haven’t done for a while, I’ll often just do it for myself just to remind myself of how to do it because, you can sometimes think, ‘Oh, now there was a way of doing that and I can’t,’ but once you start doing it you often remember so I’ve spent a lot of time doing that. At home actually, I spend most of my time hand sewing. I like, I like hand sewing. I’m in the middle of making a… I’m just started on a, a quilt using my scrap box, which is half inch hexagons all done by hand so they’re tiny, but I’m using up a lot of my scrap bits. I do talks and one of the talks is wadding and so I’ve made lots of little quilts for that. If I do a new talk I’ll do examples for that so I spend a lot of time at home actually doing preparation stuff. I’m getting better at it now in that if I’m doing preparation stuff I do it properly and I do it in stages and I keep It all [laughs] documented so I don’t have to do it again. There was a time when I’d just do it and finish it and, and then somebody else asks you to do it and you think, ‘Oh, I’ve gotta do that again.’ So now I literally do the Blue Peter bit, here’s one I… this is this first stage and this is one I did earlier and so on. KH: And how much time do you think you spend on things like that? SN: [Expels air]… difficult. Because, because it’s a pleasure rather than a chore I don’t view it as something I’m, I, I don’t resent it in any way, and, and so I, I kind of don’t take notice, but it has to fit in with all the other things I do in my life so, they tend to take quite a while because I don’t do it for, for any great length of time. But I, I… But the thing I do enjoy now is quilting. When I started, and I think most people do, I think most people come to patchwork and quilting through the patchwork because they like fabric and they like colour and, and all the rest of it, and, and I did too, and I look back at some of my early stuff and groan really because it’s not quilted enough, whereas now I really enjoy the quilting bit so my piecing gets simpler because I concentrate more on the quilting bit. And I get very frustrated sometimes when you go to exhibitions and you see things and I think, ‘That would just look so much better if it had a bit more quilting on it’ [laughs]. KH: Mmm. Which exhibitions do you go to? SN: I go to Malvern sometimes. I usually go to the Festival, ’cause I always have a friend who comes to stay so we always go to Festival. And I will, if I’m away somewhere and there’s a local quilt show on I’ll go, but I wouldn’t tra… I, I, I don’t normally travel specifically, but often I’ve found I’ve been on holiday and there’s been something on locally and I’ve gone. But the, the main one is Festival of Quilts. KH: And where do you… Do you use those e… Where do you get your ideas for your next quilt from? SN: It depends. It depends on a few things really, I suppose. Depends if I’m making it for somebody, because if I’m making it for somebody I will take into account who, who it’s for, why I’m making it. I, I made a quilt rec… I’ve just made a quilt for my son for Christmas, and that was a design I’ve done previously which I adapted to suit what he and his wife wanted, and the colours were what they wanted. I’d made the same quilt for a friend, but I’d actually… it was… the design was slightly different because it suited her rather than them. I don’t often make quilts specifically for people, though I have done a bit [clock chiming] recently, because I would only make a quilt for somebody specifically if I knew they would really, really appreciate it. I think just because we all like patchwork and quilting we shouldn’t assume that the rest of the world does, because they don’t [laughs] always, and what to us is beautiful to somebody else is a bit naff or a bit old-fashioned or… whatever. So I’ll tend to make things because I like them or I like the fabric or I’ve seen a design I quite like. I’m very, I’m very, mmm, I don’t know what’s the word really. I get ideas from all over. And I can never really pin down where exactly they come from, but I look at, look at stuff and I’ll look on, I look at stuff, I look at internet, I look at colours that I like, I’ll… see something that I like, and I’ll think, ‘Oh, well I could use that, but I wouldn’t use it quite like that, I’d do that with it.’ I rarely do things exactly as I’ve seen. And it can take me a long time. I’ve got a lot of hand dyes at the moment which is a rainbow which I want to do something with. And actually it’s been in the gestation period for about two years now. I’m getting closer to what I’m actually going to do with it, but it’s fabric that I’m, I, for me is quite special so I don’t want to do anything that isn’t special, so I shall wait until I’m absolutely sure. And I find things develop and then all of a sudden one day the light will come on and I’ll know exactly what I want to do with it. But I can’t force that process, I find. KH: So what do you regard as your next big challenge in quilting? SN: Oh! Well I think that’s my next big challenge actually is that I’ve, I’ve got all these hand dyes. I’ve got a rainbow, I’ve got 17 different colours within my rainbow, and I want to do a quilt that’s a rainbow quilt, [Clears throat] preferably on a dark background on black or navy or a… because I think the colours really pop. But I haven’t got very much of each fabric, so I haven’t got any to waste so I’ve got to be very sure of what I’m gonna do. So I’ve been looking at Fibonacci Sequence, you know the number sequences, I’ve been looking at rainbow designs, I’ve been looking at blocks that you could shade so you could have a block that goes from sort of pale yellow to dark yellow and then the next one could go from yellow to green and, and so on but nothing yet has quite… sparked and so I won’t attempt it until something says, because I find quilts talk to me. It sounds silly, but when I’m making a quilt, if I’ve got a problem with it, if it’s not going quite right or I’m not happy with it for some reason, I put it on my back bedroom bed, and every time I go upstairs I walk round it, and eventually it will tell me what to do … in a strange way [laughs]. KH: Oh I think I know what you’re talking about [laughter]. Do you have a workroom that you work in? SN: Yes, I do. Yes, I do. SN: It’s very small and very full. And my husband did say to me the other day, ‘Why don’t you move into the larger room?’ And I said, ‘No, that would be, that would be fatal.’ And he said, ‘Why?’ I said, ‘I’d just fill it.’ So I don’t think I would end up with any more useable [laughs] space than I’ve currently got, so it’s quite a discipline to have a small space. But if I’ve got a big project on like this quilt was a big project, and I needed space I s…, because there was such a lot of quilting to do on this quilt, I couldn’t do it all in one go. You can’t quilt for long hours, it doesn’t work. So I just set this up on the dining room table so it was set up all the time, so if I’d got half an hour I could go and do half an hour. You know while the potatoes were cooking I could go and do half an hour, or whatever, so that I didn’t have to get it in and out all the time because that, that persuades you not to do it. You know if you’ve got to actually get the machine out and set the machine up and you’ve only got half an hour you’re thinking it’s not worth doing, whereas if it’s all there ready, and I have a very understanding husband, who’s a model maker fortunately, so he appreciates time and effort [laughs]. KH: Stop [whispered]. All right [whispered]. Continuing with the interview with Sue Nickson. Sue, how many quilts do you think you might have made, and what’s become of them all? SN: Mmm, well that’s a very good question. I suspect I’ve probably made in the region of 40 to 50 over the last 16 years. Um quite a lot of those are small, because I use them as teaching aids really so they stay with me; my back bedroom is got stacks of them in it. But they’re used for different things. I do talks on different subjects so, some of them, there’s a whole range of them, there’s about ten of them, that have got different waddings in them so when I talk about different waddings people can actually feel how different waddings feel when they’re quilted. I do a talk on colour, so some of them get involved in that because of the colours that I’ve used within them so they’re part of that talk. Others get involved… I do a talk on borders and sashing and how that affects the finish of the quilt, so some of them illustrate that. So th… some get given away. I make baby quilts for f… people and when I was working. All my employees got a baby quilt if they had a baby. In fact the last baby quilt is being delivered tomorrow [laughs]. I used to make their wedding cakes and if I made their wedding cake they got a quilt for their first baby. So I make baby quilts which I give away. I make… I’ve made quilts for the family which I’ve given away. I’ve made quilts for myself, but quite a lot of them have actually been made to illustrate the talks that I do and they… I find them very useful if I’ve got a workshop as well; I take them as examples of… in a workshop, and I actually find them very useful in the groups that I have because if somebody says, ‘I’m thinking of doing this,’ sometimes I’ve got something that illustrates it and I sort of say, ‘Do you mean like this,’ because they often… I find the biggest problem with people in the groups that I teach is visualising what things are gonna look like or how big they’re going to look, you know? Somebody will s-say they’ve got a nice picture of a quilt. I had a lady not so long ago, she brought a picture of a quilt in, she said, ‘I really like that,’ and each block was a maple leaf, which was very pretty. And she said, ‘How many of those am I gonna make?’ I said, ‘How big are they?’ And she said, ‘Oh, I don’t know, but this quilt’s got,’ however many each way. They were only four-inch blocks, so I said, ‘You’re going to have to make an awful lot of those.’ But from a picture you can’t tell what size they are. So then when we showed her a six-inch block and said, ‘But of course you could make it a nine-inch block,’ ‘Ah, that would be better.’ So I find they’re very useful as teaching aids really, visual help to people… to choose what they’re going to do, because I don’t like to make decisions for people but I like to nudge them in, in the direction I think they would be better going. I don’t like people to embark on things that are beyond them, in as far as I think it’s very depressing to fail. I remember once years and years ago when I started quilting somebody once said to me, ‘Start with a cushion cover and if you end up with a quilt, great. If you start with a quilt and end up with a cushion cover, it’s a bit depressing,’ and I think that’s very true. So I like to try and encourage people to do stuff that’s within their capabilities to start with, but then I like to… once they… once they’re established, and they decided they like this process, then I like to push them into trying things that they don’t necessarily feel comfortable with. In the Beoley Babes group on a Wednesday last year we did a sampler quilt, and into that I introduced all kinds of things that they hadn’t done, a lot of them hadn’t done before. And that was really interesting, because we didn’t do a standard sampler quilt where the… all the blocks are the same size, all the blocks were different sizes so they fitted together in different ways and, but then they could in… They all made the same blocks but they could put them together in different ways so they could put their own stamp on it. And I use the same principle to encourage people to improve. I never tell anybody it’s not good enough, I just show them somebody else’s and let them see for themselves. And you can see it on their face thinking, ‘Oh, that’s, that’s better. I’ll try harder next time.’ But I have got a couple of ladies in Beoley, one in particular who was very, very slapdash when she started. I mean curtain fabric, you know four-inch wadding, you name it. Very… Did things very quickly and not desperately well, but she has become so precise and so particular and does some lovely stuff now, and that for me is, is great. But it’s encouraging and… chivvying a bit and pushing to get people to try different things. I always say to them, ‘Try a technique. If you don’t like it, that’s fine,’ if it… ’cause some of the techniques are a bit like Marmite, you either love them or you hate them. I mean I hate foundation piecing with a passion. But I will do it because there are times when it is the best technique to use and if that’s what it is that’s what I’ll do. You know I’ve always said to them, ‘If you, if you don’t like the technique, that’s fine, you never have to do it again, but you know you’ve tried it and if you need… you might come back to it when it becomes appropriate and think, ‘I have actually done that, I could do it again.’ So that’s what I’m all about is actually… I don’t think inspire is the right word I think bully possibly [laughs] is a better word. Chivvy. I’m there to chivvy and teach and encourage people to develop and improve, which I hope they do. KH: Well I’m sure they do. Thank you Sue, and thank you for agreeing to t… to take part in Talking Quilts. The date is the 5th of April, 2016.